BERRIEN SPRINGS, Mich. --- Thousands of Berrien Springs residents are heading into 2015 with disappointment in their hearts as a major Andrews University-based fireworks show was canceled by the local Fire Department. 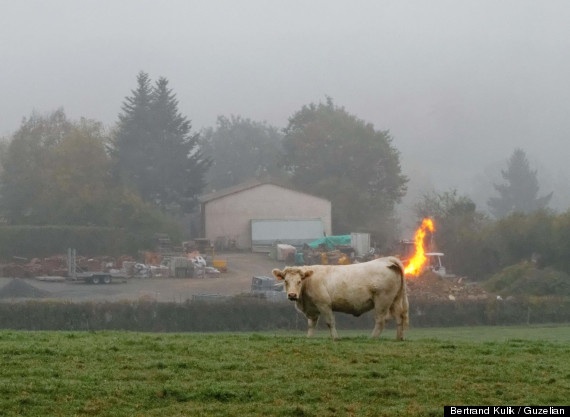 "The cows at the Andrews dairy have been emitting record high levels of methane gas," said Chief Todd Neeley of the Berrien Springs Oronoko Township Fire Department. "The last thing we need is for stray fireworks to spark an explosion at the farm." "Explosions due to sparked methane are a very real danger at dairy farms," said Andrews Dairy Herd Management instructor, Genna Larsson. "We have about 1,400 cows at Andrews and each and every one of them appears to have really enjoyed the holidays. Our dairy is an explosion waiting to happen." Berrien Springs residents who are no strangers to the smells of the dairy wafting across town have dealt with the cancelation with various degrees of frustration. "I can't wait to graduate and get out of this cow town," said Senior Andrews Communication major Adrianna Luis who had come back from her Christmas break early to attend the fireworks extravaganza with local relatives. While he says that he and his friends were "super-bummed" to hear that the the fireworks has been canceled, Junior Chemistry major, Roylyn Calmer-Doleman said he was not at all surprised by the announcement. "Hundreds of cows farting and belching at the same time are no joke. I've changed my jogging route to avoid the dairy until this blows over." Cows are vegetarian. Two stomachs. Perhaps they have been injesting & digesting leftover food scraps from the school cafeteria. Woe is me. Imagine 4 times a many gas-producing devices as the average human! No wonder there is such a problem.Good thing they only feed them grain and hay. If we gave them beans the entire area might just disappear in a big mushroom cloud one of these days. Those leaving comments, would be wise were they to get the facts prior to writing nonsense. The stomach of the Dairy Cow comprises FOUR compartments, namely; Rumen Reticulum, Omasum and Abomasum. So please stop vilifying those gentle creatures while pouring cream into coffee or adding milk to cereal etc. ‘Ever been around people a few hours after they have partaken of certain foods that humans are wont to consume? I rest my case.